Provide AMD AM4 compatibility to either the NH-L9a or NH-L9i CPU coolers from Noctua using the NM-AM4-L9aL9i kit. The NM-AM4-L9aL9i kit allows Noctua users to upgrade NH-L9a and NH-L9i coolers to AMD's AM4 socket (Ryzen). It is a dedicated solution for the NH-L9a and NH-L9i models and has been designed to combine outstanding reliability, optimal contact pressure and easy, straightforward installation. 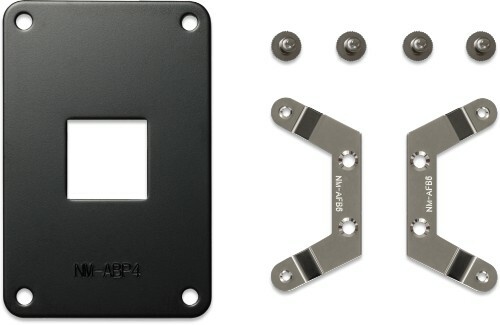 Bringing the trusted SecuFirm2 quality to AMD's AM4 platform, the NM-AM4-L9aL9i is an enthusiast-grade mounting kit that meets the highest demands in safety, performance and ease of use. The NM-AM4-L9aL9i kit is compatible with the NH-L9a & NH-L9i only (please choose the NM-AM4-UxS kit for the NH-U14S, NH-U12S and NH-U9 and the NM-AM4 kit for all other models). Owners of the NH-L9a and NH-L9i can obtain the NM-AM4-L9aL9i mounting-kit free of charge via this form. Proof of purchase (photo, scan or screenshot of the invoice) of both an NH-L9a/NH-L9i cooler and either a socket AM4 motherboard or socket AM4 CPU are required. Please note: This offer is run and fulfilled by Noctua, Quiet PC are not able to supply the free kit on Noctua's behalf. Please note: The NH-L9i has been designed for the Intel LGA115x platform. While it can be installed without any problems on most AM4 motherboards using the NM-AM4-L9aL9i kit, it is possible that it may not fit in some cases. Therefore, please be extra careful when installing the NH-L9i on AM4 and verify that the cooler doesn't press against any other components. Please also see this FAQ for details.